Paul is shocked at what's been written about him in the paper by Kerry. Paul comes storming round to see Kerry - Joe answers the door. JOE: What do you want. Shouldn't you be off nicking lollipops off kids or something? PAUL: Nice to see you too, Joe. How's it going in business. Kerry comes out and tells Paul that she'll stand by everything she wrote in the newspaper article. Paul claims Kerry was libellous - she said Paul was paying off someone in the council. Kerry says she didn't mean it literally, but Paul's solicitor doesn't see it that way - they've advised him to sue. KERRY: You can't do that. PAUL: Can't I? You just watch me. I'm going to hit you with a lawsuit that will cost you everything. Jim and Beverly are out to dinner. They are both nervous and want things to go well. 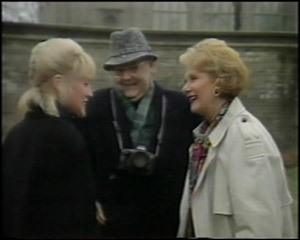 Jim gives Beverly a necklace that he meant to give her before and apologises for holding a grudge against her. Beverly quickly shuts the necklace box, saying it doesn't go with what she's wearing. Jim goes on to say that he thinks they can work things out. Beverly says she hopes so too, but she does not look convinced. Helen is reading all the postcards Madge and Harold have sent while Nick and Sharon do their homework. Nick is still waiting to hear from the Art School. Madge and Harold are wandering round - goodness me! 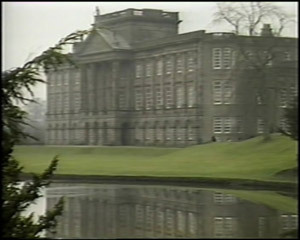 That's Lyme Park near Manchester, aka Mr Darcy's house in the BBC's Pride and Prejudice series! They are taking photos when they bump into Rosemary Daniels - just by chance(!) They chat about their trip and the souvenirs they've picked up. Rosemary is looking to do a deal for tourists to stay at stately homes and castles - that's why she's here - to meet the owner. Joe is mad at Paul's threat. Having re-read the article, Kerry is worried - her words could be read that way. She wonders if she should get an apology printed. Joe doesn't like it, but says they can't afford to take such a big risk. Kerry says she'll still continue the campaign though. Joe looks very worried. Jim and Beverly are chatting about their lives. Jim explains that he gave up his engineering business and took on the workshop so he could relax a bit and work 9am-5pm. But that's no good if Beverly isn't there when he gets home, because he'll never see her. Beverly says that she still has a lot to achieve in medicine - she wants to research into the aging process. Jim says he just wants more time with Beverly, and things keep taking her away. Beverly says that since she doesn't have children, she needs to find fulfillment through her career. They wonder if there's a compromise - a way to accommodate each other more. Beverly suggests that they could have round of golf on Wednesday - she hasn't got any appointments. Jim is pleased. Ryan comes round looking for Nick - he wants to borrow a video from him. Sharon suggests he joins them for a coffee first. They ask Ryan how he's getting on and they chat about the school dance. Ryan says there's no-one he knows well enough to invite. 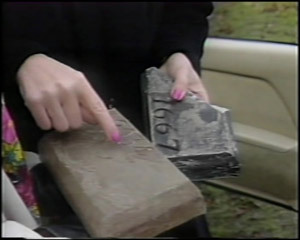 Madge has found an old stone dated 1667 and is very excited. She wants to take it as a souvenir but Harold protests. Madge puts it in his bag anyway! Just then the gardener passes by. Kerry wants to do a rally in the playground, but Joe doesn't want Kerry to get into more trouble. He doesn't think the council will listen to anyone - it's just not worth it. Kerry is upset and accuses Joe of being unsupportive. Joe tries to give Kerry a reality check - he's struggling for work to support her and Sky as it is. Kerry says she can't back down - she'd feel lousy about herself. Eventually he concedes and agrees to support her. JOE: Onward. And upward. We'll show Paul Robinson. Nick asks Sharon what she's going to do - he can see how much she likes Ryan. She says she'll talk to Kirsten, but she doesn't like it. Harold is still berating Madge about stealing the stone. 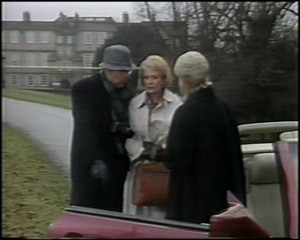 Rosemary drives up in her car and Harold tries to get Rosemary to talk sense into her. 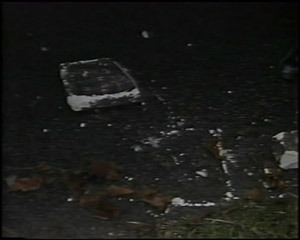 Rosemary insists on having a look and when they get it out, the stone falls to the ground and breaks in two. Harold rolls his eyes. Jim and Beverly have just arrived home. Helen comes in for a visit. She says she's settled in well to Bronwyn's room at the Bishops' place. 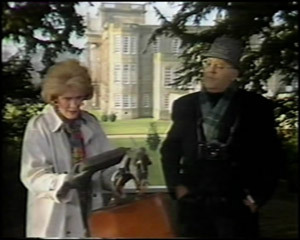 Helen gives Jim a letter to send to Madge and Harold to take to the post office. He goes off to find some stamps. Helen is pleased to hear that Jim and Beverly are going to play golf together. Beverly still doesn't seem sure about their relationship though - she says they've drifted quite far apart. 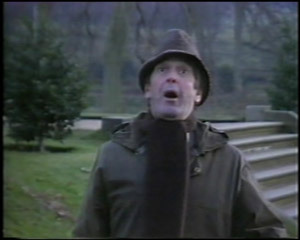 Harold is aghast about the stone, but it turns out that it's from the souvenir shop - Rosemary has got one too! Madge laughs in relief. Rosemary tells them that Lord Ledgerwood was unavailable today, and she has to fly off on business tomorrow. Madge suggests she writes a letter and they'll come back tomorrow and give it to the Lord in person.